dike, and ultimately released into a basin adjacent to the Harrison River. There are 1,000 km of dikes, pumps and floodgates in communities across BC designed to protect homes, businesses and utilities from the risk of flood. But development in the floodplain, coupled with such flood protection measures, such as dikes and drainage, come at a cost. They often result in loss or degradation of aquatic habitat and disruption of fish passage. Are there better options? A 2010 report from the Fraser Basin Council, Environmental Protection in Flood Hazard Management: A Guide for Practitioners, explores options in flood hazard management, with an eye to better environmental protection. Local authorities, regulatory agencies and water stewards will find in the Guide a useful synopsis of modern flood protection options, including local innovations. 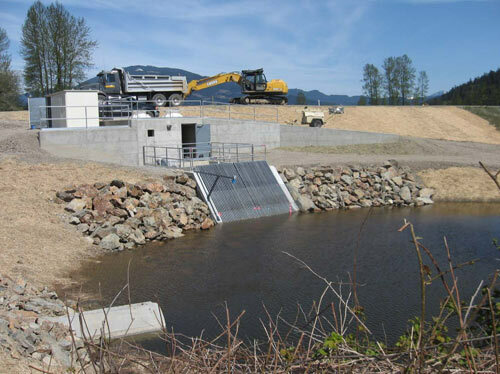 With many BC communities ready to replace or upgrade flood protection works, the Guide offers a timely look at some of the best management practices to protect communities and the environment. The Fraser Basin Council hosted an educational workshop in 2009 and published the report in 2010, with funding from the Fraser Salmon and Watersheds Program. Read the report to see what is possible through environmental assessments and monitoring, land use planning for floodplain areas, set-back dikes, fish-friendly pumps and floodgates, sediment ponds and habitat restoration. Social well-being supported by a vibrant economy and sustained by a healthy environment. The Fraser Basin Council (FBC) is a charitable non-profit organization that brings people together to advance sustainability in the Fraser River Basin and throughout BC. Established in 1997, FBC is a collaboration of four orders of government (federal, provincial, local and First Nations) along with those from the private sector and civil society. We work with people in multiple sectors, helping them find collaborative solutions to today’s issues through a commitment to the social, economic and environmental dimensions of sustainability. Our focus is on healthy water and watersheds, action on climate change and air quality and strong, resilient communities and regions. FBC has offices in Vancouver, Kamloops, Williams Lake, Quesnel and Prince George. We also have staff located in Abbotsford and Vernon. To reach us, see FBC Offices and FBC Staff.